Wow. This is shockingly surprising all the same. Are they actually holding their own people accountable? And wasn’t that one guy who wrote the report a major fabricator of stories on more than one occasion? According to new reports, Buzzfeed is planning to lay off 15% of their workforce. The Journal notes growing pressure in the online publishing space and digital advertising sales – pointing to competition from Google and Facebook, and recent industry moves such as the $5 million sale of online publisher Mic to women-focused publisher Bustle Digital Group. Lifestyle-focused publisher Refinery29, meanwhile, laid off 10% of its workforce last fall. BuzzFeed, launched in 2016 by CEO Jonah Peretti, was a pioneer in “native advertising,” designed to mimic the look and feel of editorial content. As that model has become increasingly difficult to grow, the company began selling ads using “programmatic,” or automated platforms last year. 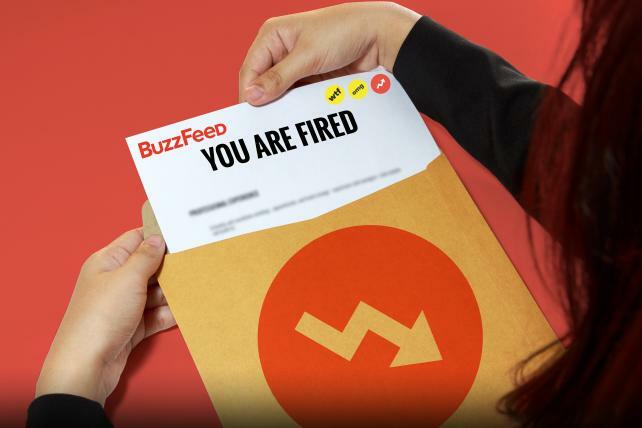 The 15% workforce cut follows a 2017 round of layoffs, when BuzzFeed cut loose around 100 staffers after missing its revenue target of around $350 million by a 15% – 20%; a miss which put the company’s IPO on hold. In 2016 the company brought in around $250 million in revenue. Since then, BuzzFeed clsoed its operations in France and fired their in-house podcast production team.